England World Cup winner Sir Geoff Hurst has signed up for the 2018/19 Grosvenor Goals campaign. 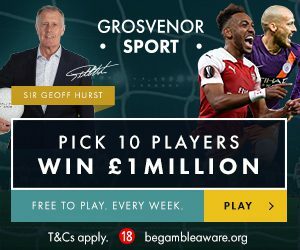 The legendary ex-West Ham, Stoke and West Brom striker will be providing weekly picks as a brand ambassador for Grosvenor Goals, which gives users the chance to win £1 million if their 10 chosen players are all first goal scorers in a given game week. The free-to-play game, which will be running throughout the 2018/19 season, will also offer £10k for anyone who predicts 10 anytime goal scorers from their selections, with a £10 free bet to those who successfully pick three or more first scorers each week. Sir Geoff will play his part too – if he selects four or more first goal scorers in a game week, all users who play Grosvenor Goals that week will win a £10 free bet. Here’s his picks for the weekend ahead as the Premier League gets underway. Christian Eriksen was fantastic for Spurs last season, scoring 10 goals – five of those helped Tottenham open the scoring, and I think he can do so again against Newcastle in the early kick-off on Saturday. A return of eight goals in a season littered with injuries was still a good return for Callum Wilson, and I think he’ll get off to a good start at home to Cardiff on Saturday. Palace relied heavily on Wilfried Zaha last season, as he averaged one goal for every three starts. It looks like he could play an even more attacking role this season, and he’ll be a threat to Fulham at Craven Cottage in their first Premier League game in four years. The Spaniard started last season in flying form, scoring six in his first ten Premier League outings – including a hattrick against Stoke. He’s had a fairly quiet pre-season, but I’ve just got a feeling he may have a point to prove and start this campaign with a goal. The Watford captain loves playing at home – all of his goals last season came at Vicarage Road, so he will fancy his chances opening his account this term at home to Brighton. The Portuguese winger played a vital part in his side’s Championship victory last season, and he’s looked sharp in pre-season matches too. I think he can cause Everton problems in Saturday’s evening kick-off and wouldn’t be surprised to see him bag a goal. Hernandez scored in Leeds’ season opener against Stoke last weekend. He’s a player with great technique and I think he’ll be a thorn in Derby’s side in this exciting fixture. I’m hoping West Ham can get a result at Anfield, but it’s hard to see past Mohamed Salah opening the scoring in this one. The Egyptian scored 44 goals across all competitions for the Reds last season, including three in two outings against the Hammers. The New Zealand man has scored six goals in his last nine Premier League matches, and he’ll be a handful for the Southampton defence on Sunday. The Argentinian averaged 0.84 goals per game last season and ended with 21 goals in total. He scored two against Arsenal last season, and he’ll be on the hunt for more at the Emirates in arguably the Premier League’s biggest opening fixture.